Mayor Carolyn Kay Riggle reads a proclamation to Lindsay Collins, assistant director of development for the Alzheimer’s Association, Central Ohio Chapter, during Monday’s Delaware City Council meeting. Pictured is the mayoral proclamation read by Delaware Mayor Carolyn Kay Riggle during Monday’s City Council meeting. Alzheimer’s disease is the sixth leading cause of death in the United States. While funding and breakthroughs in research have led to significant decreases in the deaths associated with many of the leading causes of death, such as heart disease and cancer, the mortality rate for those diagnosed with Alzheimer’s continues to increase. The somber reality is that there is no cure for the disease, nor is there any way to slow down the spread of it once diagnosed. 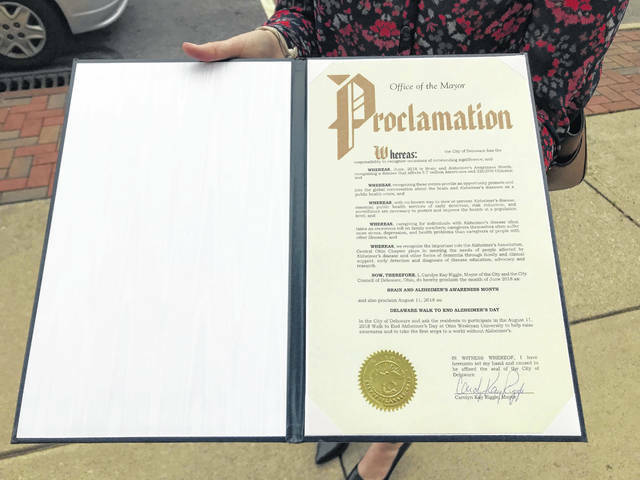 With the fight to end the disease in need of any and every bit of attention it can receive, Delaware City Council did its part to bring attention to the fight by issuing a proclamation at Monday’s meeting to establish this month as Brain and Alzheimer’s Awareness month, as well as proclaiming Aug. 11 as Delaware’s Walk to End Alzheimer’s day. 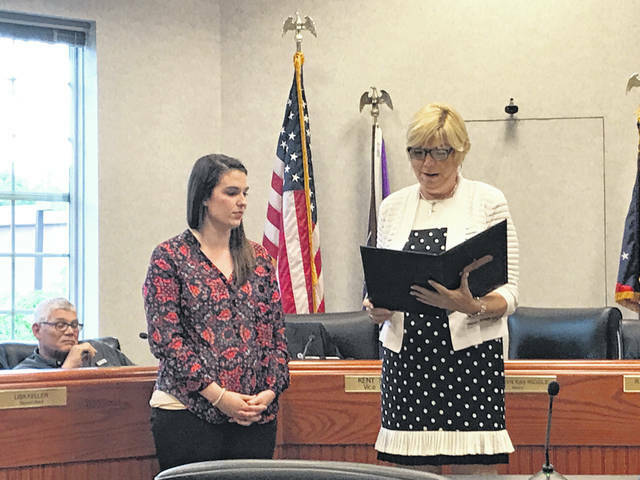 Lindsay Collins, an assistant director of development for the central Ohio chapter of the Alzheimer’s Association, was on hand to accept the proclamation from Mayor Carolyn Kay Riggle. Riggle, whose father struggles with Alzheimer’s, was overcome with emotion as she read the proclamation, passing it on to Vice Mayor Kent Shafer to finish. In addition to Riggle’s father, City Council Clerk Elaine McCloskey’s father also suffers from the disease, making for a sobering moment as the proclamation was given to Collins. After Shafer finished reading the proclamation, Riggle suggested council members get a team together for the walk. The chapter serves 14 counties around central Ohio, including Franklin, Union, Delaware, Marion and Morrow counties. In Delaware, the local office can be found in Andrews House, located at 39 W. Winter St., or reached at 740-363-1365. Collins said there is a part-time clinician there who can help the Delaware community with services and questions. Perhaps the most valuable resource the Alzheimer’s Association provides is a 24/7 helpline that is operated by licensed social workers and clinicians right here in central Ohio from 9 a.m. to 5 p.m. each day. After hours, calls are directed to representatives at the national office in Chicago. Whether it be any type of crisis associated with the disease or simply a fundraising question, citizens can call 1-800-272-3900 at any time. The Walk to End Alzheimer’s remains the chapter’s biggest event, one Collins called “an awesome day of hope.” The registration hour begins at 8 a.m., followed by a fun, jazzercise-style warmup. Before the race begins, there is a ceremony to share the stories of participants in the walk. In describing the different types of stories that will be shared, Collins said the ceremony is the most powerful moment of the day. Dogs are also welcomed for the event, and there will be various activities that make the walk kid-friendly as well. Like the disease that impacts so many entire families around the country and world, the walk itself is also very much a family affair. Anyone interested in registering or donating can visit act.alz.org/delawareohio. The walk, itself, is free, but the fundraising drives the research for a cure. Currently, the amount of funds raised through the upcoming walk sits at $25,000, although the goal is to reach $79,500. Those wishing to volunteer can also visit the page and click on the volunteer button. Collins said they are always in need of volunteers to help the morning of the walk.